HO, Ghana (CNS) — Families today live in complex situations, and Pope Francis “invites us to look at the reality of the family today in all its complexity, with both in its lights and shadows, in faithfulness to Christ’s teaching,” the pope’s representative told Ghana’s bishops. Speaking Nov. 13 at the opening of the bishops’ fall general assembly, Archbishop Jean-Marie Speich, apostolic nuncio, said Pope Francis’ 2015 apostolic exhortation, “Amoris Laetitia,” was written to help everyone experience God’s love and to know that all were welcome members of the church. The bishops’ meeting focused on the challenges of the family. 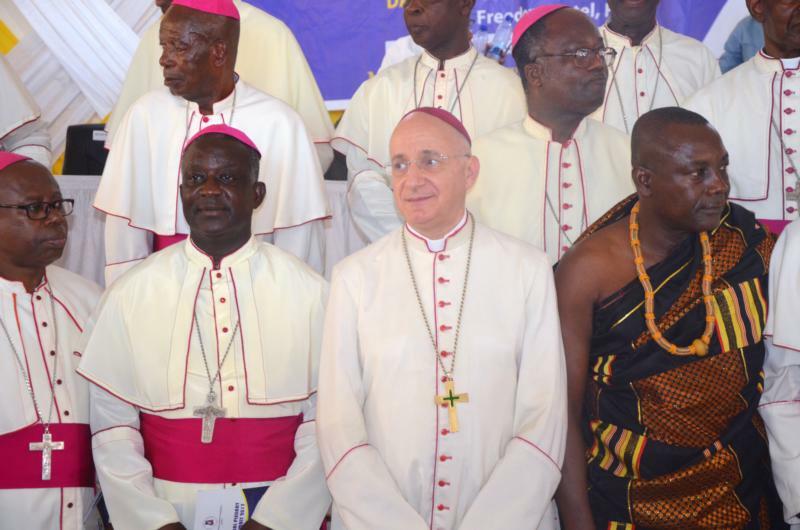 Opening the assembly, Archbishop Philip Naameh, president of the Ghana Catholic Bishops’ Conference, said young people across the social divide seemed fixated on sexuality. He said elite urban families were turning to assisted reproductive technologies to address fertility challenges. Archbishop Naameh said some couples go to their priest for direction, and the church must consider the moral dilemmas such couples face. He also said the church needs to intervene in the traditions of widowhood. A document on sedosmission.org, a forum for international religious orders, spoke of the problems of widowhood rites in Ghana. “Most of the widowhood rites were being spearheaded by women who suppress the widows, torture, strip them naked, shave their hairs, and force them to drink concoctions prepared with leaves, hairs and fingernails of their late husbands,” it said. “Apart from forcing the widows to sleep with the corpse for three or more days, most of the women and their children are also denied food and shelter. The multiple human rights violations widows and their children go through in this part of the globe, in the name of culture, has led widows into extreme poverty, migration, social oppression, with many children being denied access to education and health. A lot of widows and their children are denied their autonomy and independence. Most of the widows, who could not stand the humiliation, beatings, and other ill-treatment, sometimes commit suicide,” it said. Archbishop Naameh said the issue of bride price, or a dowry, which was frequently taken out of its original traditional context, was becoming increasingly exaggerated. “The expense of marrying properly, according to traditional rules, has become, in some cases, quite burdensome for the average young man in Ghana seeking hand of a woman in marriage,” he said. He also spoke of trends that were not within the ideal family image foreseen by the church’s tradition of faith and morals: “teenage and single parenthood, poor or irresponsible parenting, separate household and distant marriages that make couples live apart, and in some cases far away from each other and relatives. He said that young people faced peer pressure, physical and digital, and lamented that social media rules their lives. Archbishop Naameh said parishes needed marriage counselors, who would work with the priests and identify families in need of care.